Aug. 3, 2012, 10:54 a.m. The Times’ “quick links” allow writers to better illustrate parts of a story through pop-up multimedia within an article. By Justin Ellis @JustinNXT Aug. 3, 2012, 10:54 a.m.
Sharp-eyed readers of The New York Times may have noticed an unusual collection of links within Amy O’Leary’s Thursday story on sexual harassment in the world of online gaming. The links had a shaded blue background and tiny icons, and when clicked, up popped a video or an image — floating on top of the story but integrated within the flow of reading it. The Times calls them “quick links,” and they’re intended to add a new way for Times reporters to add depth to online storytelling. And at a time when mainstream news organizations are criticized for barely linking at all, it’s an attempt to embrace a reading process that isn’t completely linear, one that allows for optional digressions. While the idea, and the technology, for the pop-up link is not new, quick links show the Times wants to openly experiment with its storytelling. The Times first developed quick links last November in conjunction with Amy Harmon’s story on a year in the life of Justin Canha, a young man with autism trying to prepare for a life of independence. The links were built out of need, Williams said, as Harmon wanted to find a way to make the story more impactful through using video. Rather than embedding a full six- or seven-minute video, the editors wanted to find a way to intersperse clips of him throughout the piece without breaking up the flow of the story. The solution was quick links. Williams said he worked with people from the Times editorial design department on developing the links. The key, he said, was simplicity: making something that fits into the visual language of the Times but still looks unique. “I only had one real requirement in my head and that was it doesn’t interrupt the primary narrative,” Williams said. The Times has also used quick links on stories about the creation of the Sept. 11 museum and the connection between opera and food. The Times employed a similar feature in the multimedia package on Derek Boogaard; the video feature would pause and point to related documents, maps and slideshows. The sparing use of quick links is a conscious choice, but also a production issue, Williams said: They aren’t built into the Times CMS, which makes a broader deployment tricky. But Williams said the links are most effective when used sparingly and in the right stories. 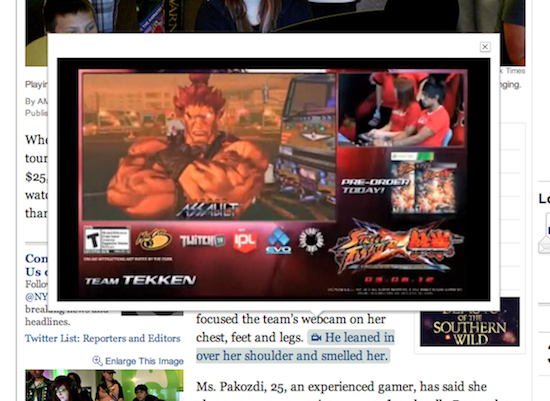 In the case of Amy O’Leary’s look at sexual harassment against female online gamers, there are key parts of the story that can be referenced in video; watching a creepy guy smell a female gamer does something that reading about it can’t. O’Leary told me the links are effective at immersing readers in a part of a story. “It helps people to see directly some of the incidents that spurred this new stage of discussion about harassment in gaming,” she said. POSTED Aug. 3, 2012, 10:54 a.m.
Ellis, Justin. "Watch a creepy guy smell someone: The New York Times builds contextual multimedia into the flow of a story." Nieman Journalism Lab. Nieman Foundation for Journalism at Harvard, 3 Aug. 2012. Web. 20 Apr. 2019. Ellis, Justin. "Watch a creepy guy smell someone: The New York Times builds contextual multimedia into the flow of a story." Nieman Journalism Lab. Last modified August 3, 2012. Accessed April 20, 2019. https://www.niemanlab.org/2012/08/watch-a-creepy-guy-smell-someone-the-new-york-times-builds-contextual-multimedia-into-the-flow-of-a-story/.